Simpson Cleaning - Find The Best Product for your Needs! The company is actually pretty famous for making gas pressure washer. People who want a powerful engine and extreme water pressure they usually tend to go for Simpson products. The reviews given by the pressure washer users about Simpson are very good. The company makes not only residential power washers but also the commercial pressure washers. 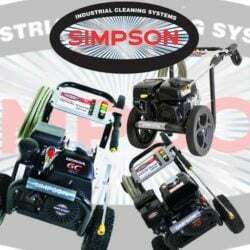 There is no doubt in the power and durability of Simpson’s pressure washers. They have been doing business for many years and understand the consumers’ needs. If you want to talk to them, the address is 7152, 99th Street, Pleasant Prairie, WI 53158, P: 847.348.1500, F: 847.882.7229.